Learn more about the blue mist in the bonus chapter! Get every collectible and souvenir! Challenge yourself by replaying HOPs and mini-games! 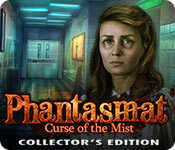 Phantasmat: Curse of the Mist Collector's Edition is rated 2.9 out of 5 by 29. 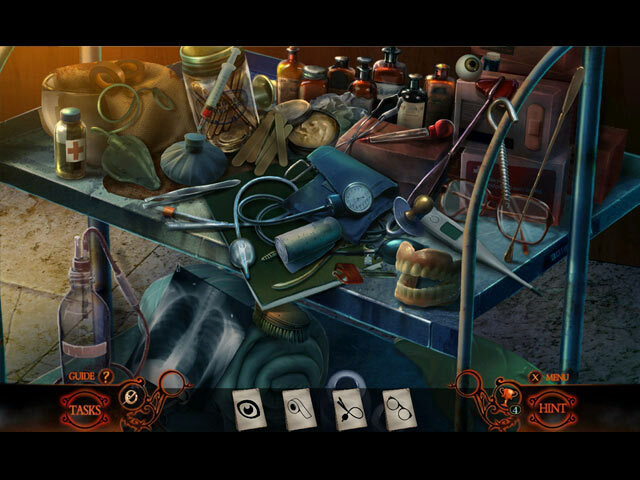 Rated 5 out of 5 by Mattandjulie from great hidden object game The best game we've played in ages, Excellent!! Rated 5 out of 5 by SparkleGlow100 from Excellent story- Excellent graphics- Review based on completed game. I skipped the cut-scenes on purpose, so I can't vouch for them – I was worried I would find them too terrifying...having that blood-chilling, mad-axe wielding, serial-killer orientated vibe. Not really my thing. But having skipped them, I could totally enjoy the spooky woods and wonder what the mist-thing was all about. Spot on graphics –lots of detail and natural colors, spooky grays and shadows. Great! HOPS were enjoyable to play because of the style and look of them. 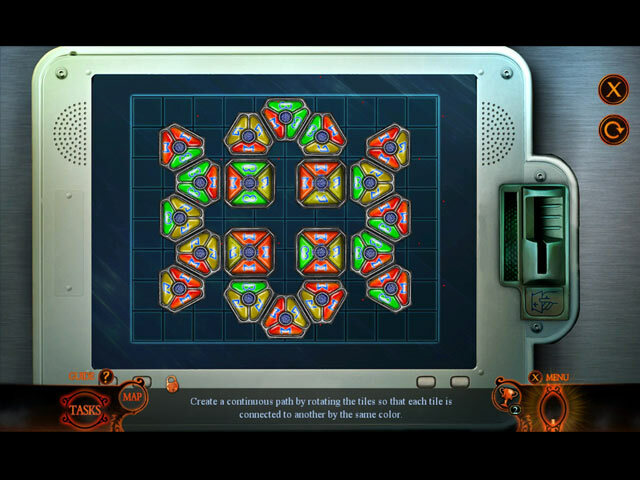 The puzzles are on the whole pretty difficult, at least for me! I muted the voice-overs so I can't leave an opinion, I didn't listen to the music, and just had the sound effects on. It was chilling enough as it was!! (I think this game is NOT as harsh, "mad-axe" and jarring as the previous Phantasmat- Insidious Dreams, because I can't finish that one.) The Bonus game in this CE is good but short. It has at least 4 more HOPS. ***********************************************************************************************************************************************************************************************************************************************************************************************************************************************************************************************************************************SPOILER ALERT BELOW******************************************************************************************************************************************************************************************************************************************************************************************************************************************************************************************************************************************************************************* Strength, kindness and insanity are all mixed into one under the stress of circumstances. The ending is pleasant because the situation is resolved and you as the hero are victorious. Rated 5 out of 5 by rockie29 from great this game was interesting from start to finish. Kept you wanting to continue till the end. great mini puzzles good mixture of hidden objects. Rated 5 out of 5 by pennmom36 from STAY BURIED, STAY SAFE Phantasmat is my favorite series, and no game has ever come close to the magnitude of the original Phantasmat by Codeminion. Curse of the Mist is an excellent addition to the series and has a great "creep" factor. However, I have several complaints not related to the storyline! First off, I was able to finish this demo with 30 minutes remaining, and that's with playing every Mini Game without skipping, AND taking the time to write down information on the game. The biggest complaint I have is with the fact that this is a coveted Collector's Edition, supposedly, yet the only bling offered is those famous Hidden Signs that are always offered in every game by this developer! One of the reasons I love this series is because I have always been able to count on Morphing Objects being available in every scene, but now they have decided to omit this beloved feature. I'd much rather see them omit those stupid Hidden Signs to be honest. I own every game in this series and they are all Collector's Editions, because there was a BOGO sale today, I purchased this game before I started the demo. Had I waited, I more than likely would not have shelled out the big bucks for a CE that has very little to offer! -end complaints- What's going on in the sleepy little town of Shady Valley? You're about to find out, because someone, or something, has taken your friend Jane. The closer you get to finding her, the thicker the strange mist gets. Where is the mist coming from, and just what kind of Phantasmat lurks somewhere between the world of the living, and the dead? I love that they have brought back the "visions" you have as you progress. It's a fantastic and creative way to fill you in on the background of the story, the who's, what's, where's, when's and why's so to speak. I've always wondered why every game seems to have diary pages spewed about, and conveniently available in every scene, as a means of telling the story, so this concept is so much more credible in my opinion. This is the section I usually explain about the many Collector's Edition version Collectibles. Here's your sign, that's all you're going to get in this CE! The Hidden Object Scenes are decent, and I liked the scene locations they chose, however, some of the HOP scenes are repeated, a feature I really hate. There's just no challenge in them when you remember where everything is because you were just there searching for objects. There are Interactive List finds, Silhouetted Shape finds, Combination Silhouetted Shape finds, Matching Symbol finds, and a really nice scene where you search for all Morphing Objects. Some scenes have zoom zones with a handful of Multiples to find as well, and you can opt for a Match 3 game instead. The Mini Games are my favorite kind, it's hard to describe, but the kind where you tinker with electrical components that are more realistic?? Below are brief descriptions of some of the Mini Games you'll encounter during the demo: 1) Follow the clues on the map to choose the correct path direction. 2) Select and drag the main fuse from the bottom to the top circle on the board, by moving other fuses to change positions of the toggle gates. 3) Create electrical paths from the light on the right to the red button by selecting the switches on the top for each column. 4) Find and select the symbols shown on the dream catcher. 5) Slide the tokens from the starting positions on the left to the positions on the right by selecting a token and a highlighted space, without hitting the obstacles that change position with each move. PHANTASMAT GAMES AVAILABLE Title***Collector's Edition Release Date***Average Rating 1-Phantasmat (February 8-2011) 4.5 2-Crucible Peak (December 6-2012) 3.8 3-The Endless Night (January 10-15) 4.0 4-The Dread of Oakville (July 9-15) 4.2 5-Behind The Mask (December 17-15) 4.4 6-Town of Lost Hope (April 7-16) 3.5 7-Reign of Shadows (October 6-16) 4.3 8-Mournful Loche (April 13-17) 3.7 9-Insidious Dreams (September 14-17) 3.8 10-Curse of the Mist (December 23-2017) n/a by: Codeminion by: ERS Games by: Eipix Entertainment This Collector's Edition version has 17 re-playable Puzzles, 14 re-playable Hidden Object Scenes, a Souvenir Room, re-playable Match 3 games, 6 Movie Videos, 6 Wallpapers, 6 Concept Art pictures, 5 Music Soundtracks, 12 Achievements to earn, 30 Hidden Signs NO Morphing Objects, a built in Strategy Guide and a Bonus Chapter, enjoy, stay buried, stay safe! Rated 5 out of 5 by rainworm from The fog and what is behind We begin in the wonderfully creepy atmosphere of a campfire story: a group of young people around a fire at the edge of a forest, laughing and joking, taking a video of the trip. But soon this takes a turn: Jane is missing. In the tent we take the rewind the camera tape and watch the sequence. Was there something behind her? Could well be just a shadow on the take but we need to find Jane. Mark goes first, through a clearing. We follow and see a guy with Jane, he has thrown her over his shoulder. We follow through the forest and finally reach an abandoned looking estate. Soon we realize, we are not welcome and when we find a graveyard with several older and newer sloppily heaped graves. By now it has become a question of life or death. 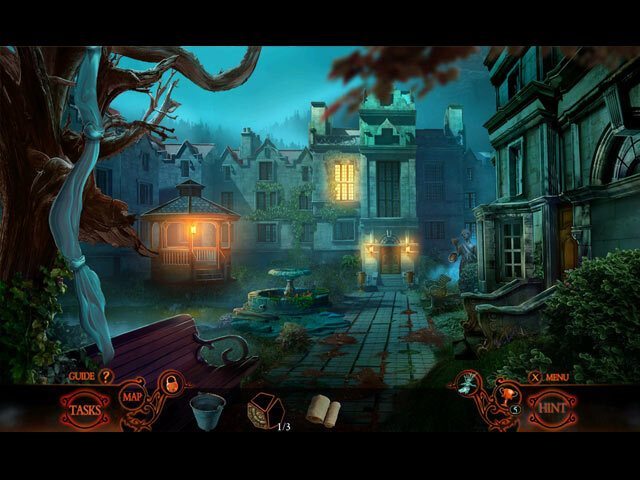 A horror story with all features, you need: the setting has this Gothic feel with the old ruined mansion and the blue-grey fog around it and in the forest. We get clues, the fog may have caused disease outbreaks, it may be poisened with impurities in the exhaust air from the Nelville Refinery. Of course we have a lot of puzzles and HOS, both variable and partly quite creative. The biggest plus for me is the setting with a suspenseful story. Rated 4 out of 5 by lynnieann95 from Yet another short game What is it with games recently. They are all so short and this is no exception. Are we now getting shorter games instead of the price going up, like less crisps in a packet but they still cost the same as when they used to have far more. I really liked this game but was so disappointed when it suddenly finished which to me normally would have been about half way through. The bonus chapter was incredibly short too. I feel cheated. Rated 4 out of 5 by 5994fairy from Phantastically easy? This is another installment in the Phantasmat series and will not disappoint if you enjoyed previous games but you might find the games a little easy.The story is not very original - unsuspecting hikers; spooky forest; creepy house and the mist! - however, I have played for so many years now that finding a truly original game is rare. Sound and picture quality excellent. Downside: it only took me a couple of hours to complete on the most challenging setting - shame! Rated 4 out of 5 by pgillenw from Enjoyed but .... Started out thinking the story was going to be an intriguing one but the development of "intrigue" didn't happen. The game was way to short as a result. Both the main and bonus game seemed to end abruptly. It's like reading a book that grabbed you in the beginning but when you finished you questioned why you hung in there. Rated 4 out of 5 by ackpfft from Getting Better, Eipix! Okay, so this isn't the best game I've ever played or anything, but it's far from the worst. I was super close to giving up on Eipix altogether. I'll keep this short, as I'm too lazy to go into heavy details....we have Sunnyglow and Pennmom36 for that (thankfully) I am a big fan of the match-3 alternative to the hog's though, so that's a plus. Map is good (like always) mini games are pretty much run of the mill Eipix style, so nothing new here. The one thing it has going for it is that the story line is pretty cool and I'm actually wanting to know what's going to happen next....which has been severely lacking in this year's Eipix games. So kudos for that. Hey! I give credit where credit is due. All in all I'm liking it and will be purchasing it with the BOGO sale today. Thanks for taking the time to read this and Happy Holidays, Fishies!! PLEASE be kind to each other! Rated 4 out of 5 by nadaze2da from Review based on demo I beta tested this game and what we are presented with in the final edition is exactly what the beta is. With the exception of a couple of games in this series, I have enjoyed them all. The last one in this series was a real stinker tho. Sometimes inconsistencies in quality in a game series can be chalked up to a change in developer. This one has certain draw backs which may be purely aesthetics on my part. I do not like the orange and black graphics used for inventory items, etc and occasionally the graphics become blurred especially in the opening scene. I also did not like the repetition of HO scenes. I did like the HO scene with the morphing objects. I found the demo to be easy. Not much of a challenge here. And for your CE money all you get is a collection of signs, the usual music downloads, screenshots, etc. The collectible signs are Eipix's usual addition to a CE game and so there is nothing offered here that is different from the past. As for the story - haven't we dealt with fogs and mists enough? There is always evil lurking in the fog. In this case, its probably the crazy man who seems intent on burying everyone he comes in contact with in the fog. One thing that didn't seem logical to me is that the first time we see this lunatic he is wearing a gas mask supposedly because of the nasty elements in the fog. The next time we meet him as he drags you to your doom, he isn't wearing one. So..... did he suddenly become immune to the fog? I'm giving this game four stars because I do think it is entertaining. However, if you are looking for challenge, I don't think you will find it here. At least not based on the demo. Most likely I will buy this game simply because I'm curious as to where the story is going to take me. Will I save the world or town or forest or whatever from the evil mist? Will I find out what caused the mist? Maybe I will end up a lunatic like the man in the story. Take this game for a spin. See if you like it. Since there is not much CE bling offered in this game and If you don't wish to part with the money for this lackluster CE, I suggest waiting for the SE. I will probably purchase the CE because I'm a sucker for collectibles and a strategy guide no matter what they are.